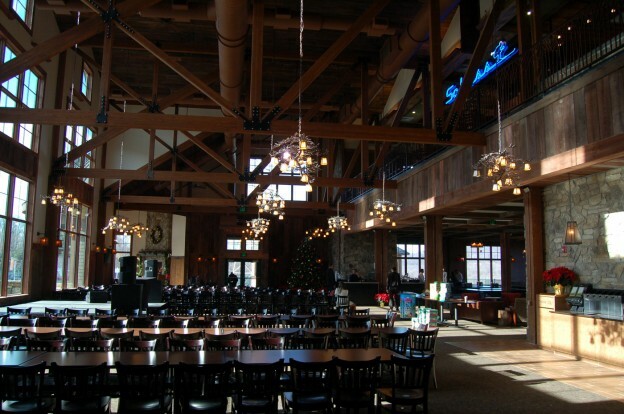 Interior design of a new 50,000 square foot ski day lodge at Mountain Creek Resort in Vernon Valley, New Jersey. The Red Tail Lodge consists of a rental shop, food court, and retail outlet. The program also consists of three separate restaurants operating within the Lodge: a private club called the Hawk’s Nest; an après-ski bar aptly named Schuss overlooking the dining area; and an outdoor dining area in a biergarten style. Finish, Lighting, and Furniture specifications illustrate a contemporary viewpoint yet present the old-fashioned concept of a warm, rustic lodge. Rustic features can be found in the wood paneling throughout the dining areas, wood trusses, and stone wall accents. The overall finish palette includes materials reminiscent of the wooded surroundings utilizing natural materials and colors of rust and sage. Decorative lighting fixtures throughout are a whimsical reminder of the landscape. This entry was posted in Interior Design, Structural Engineering on October 11, 2014 by swolock.